The Prince of Wales celebrated his 70th birthday on Wednesday with a day full of engagements, and the women in his life brought out some major jewelry for the occasion. Charles and Camilla started off the day with a special tea for 70 inspirational people who were also celebrating their 70th birthdays on Wednesday. 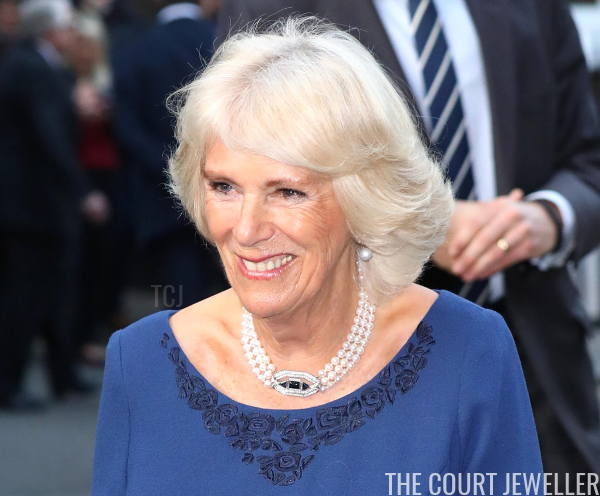 The Duchess of Cornwall wore her three-stranded pearl necklace with the diamond and sapphire Art Deco clasp for the occasion. 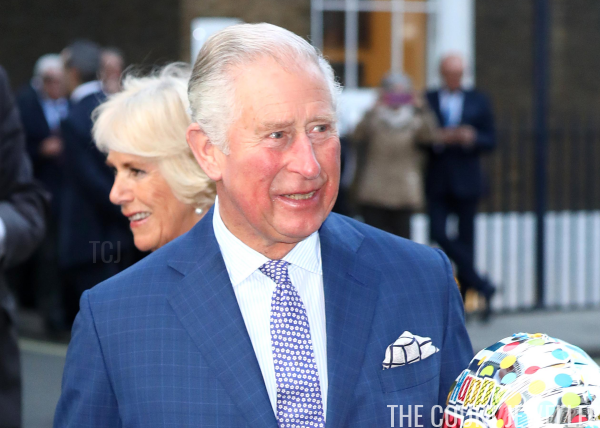 On Wednesday evening, a party was held in Charles's honor at Buckingham Palace. 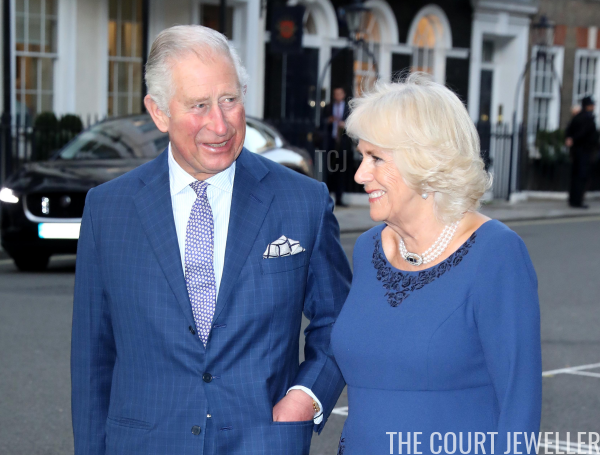 Charles and Camilla posed for an official birthday portrait as they left Clarence House for the party, so we got to see that Camilla wore her diamond cluster suite for the party. 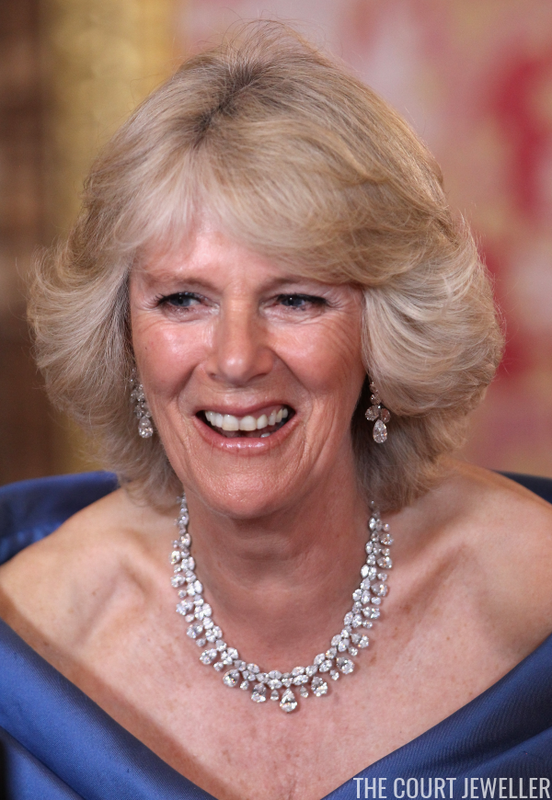 Camilla often reaches for this suite, which includes a necklace and a matching pair of earrings, for gala events. Above, she wears the set for a gala in Madrid. The official portrait of Charles and Camilla was the only "insider" glimpse we got of the festivities. Instead, we got quick glances at some of the other royals arriving by car. Here's a look at the Duchess of Cambridge's statement earrings for the party. 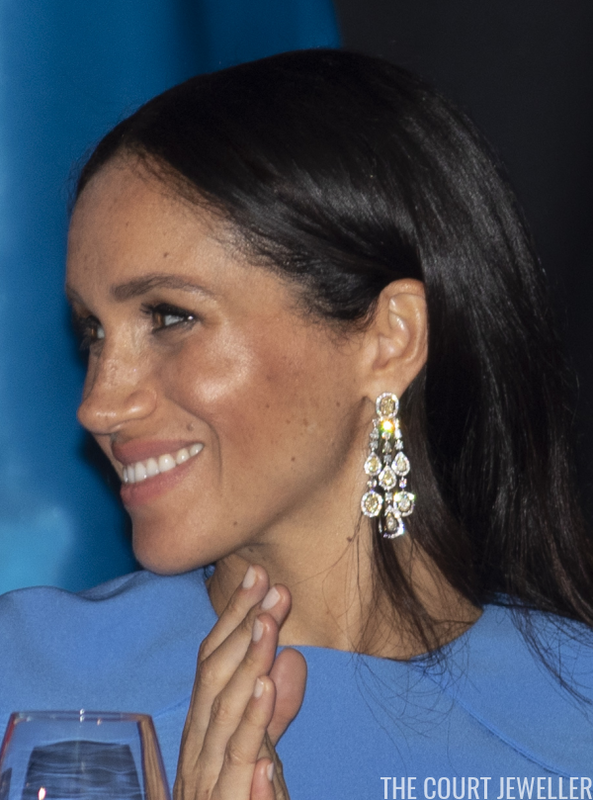 Our glimpse of Meghan arriving at the palace gave us another look at the diamond earrings she wore during her tour of Fiji. These are the earrings that the palace stated were "borrowed" without giving any additional information. Back in October, I floated a theory that the earrings might have come from Camilla's collection -- you can read more about it in our earlier post here! Newlyweds Jack Brooksbank and Princess Eugenie were also spotted arriving for the party, though we didn't get a good look at Eugenie's accessories. We also caught a glimpse of Zara Phillips Tindall, who appeared to be wearing a pair of sparkly earrings. The Duchess of Gloucester's diamonds, though, were front and center, even when viewed through the car window.